Every issue is a feast of creativity, an oasis of intellectual freedom, a place of hospitality, a panorama of the world. 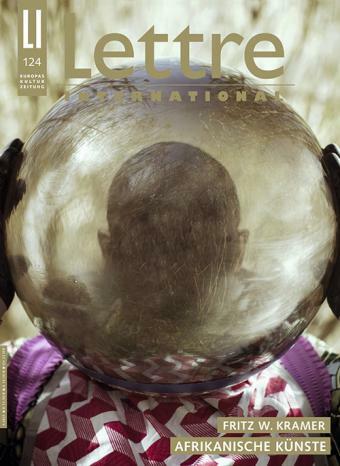 Lettre International is an independent magazine of culture with an international scope that is financed solely through the sale of its issues and the revenue raised by advertisements. Lettre is an interdisciplinary intellectual forum and does not subscribe to any political program. Published four times a year, Lettre International features a high-caliber, provocative design that combines texts and visuals. Proceeding from the most diverse positions and perspectives, authors from every global region speak out about burning, but also obscure, topics. The texts, which include a number of “discoveries,” consist exclusively of publications never before published in German. Lettre introduced many renowned authors to readers in German-speaking countries by making their translations available for the very first time. Every issue is designed exclusively by a single artist. Lettre publishes authors skilled in combining curiosity and the willingness to take risks, precision and fantasy, reflection and literary ability – writers, reporters, researchers, philosophers, scientists, critics, artists and poets. The interplay of in-depth reporting, inspired essays and lucid background analyses, thrilling interviews, brilliant short stories, multifaceted investigations, sensitive portraits, spot-on commentary and correspondence, as well as avant-garde art and photography has made Lettre the favorite read appealing to an intellectual readership that knows how to appreciate lively, serious texts. We perceive our age as an epoch of accelerated internationalization and Europeanization and simultaneously experience processes of fragmentation. Therefore we require a modern, cosmopolitan forum that enables a fast and intense exchange of observations, ideas and reflections beyond language barriers. To think on a par with the age these days means to forge a global consciousness, to integrate international horizons. Lettre seizes the opportunity of dialogue and lets us hear the inspired voices of other cultures. For Lettre, intercultural openness and curiosity is a school of tolerance and a source of cultural capital. We long for a cosmopolitan polyphony of frank, critical utterances that contributes to our ability to see ourselves through the eyes of others across national boundaries, that counteracts the provincialism of the Great Cultures, and that engages creatively with the tensions generated by the processes of Europeanization and globalization. Lettre publishes serious, well-researched and lively descriptions of our world and our age. The magazine considers itself a laboratory of curiosity and banks on quality. When it’s about how to understand complex issues, how to assess seemingly homogeneous structures, Lettre provides materials for dialogue, authentic voices and debatable opinions that serve to cultivate openness. Lettre believes in the energies of language and the power of the imagination, in spirited observations, in the illumination of contexts. Special attention is given to background analyses of explosive, current events and topics. In Lettre, even lengthier texts can thrive, because increasingly complex global contexts cannot be properly examined by using more and more reductive formulas. If we succeed in being a mirror to change, a quick-witted seismograph of the world in its fragmentation and in interaction with its cultures – their certainties as well as their upheavals – then we are that much closer to our dream magazine. A democratic public in a complex global society requires transnational vigilance and interpretation skills. The willingness of many stakeholders to censor, to limit civil rights and liberties and to manipulate the global public, as well as the power of media corporations operating on a global scale, render that much more important the independence, incorruptibleness and fearlessness of the media. The intertwining of politics, advertising and public relations, the mass media’s sensationalism and cult of celebrity, or likewise, the stereotypes of a misunderstood political correctness, contribute nothing to the ramping up of alertness, authenticity and truth in public discourse. Lettre takes on topics such as literature and theater, film and opera, music and art, religion and philosophy, ethnology and science. Global politics and history, ecology or economy, are as much integral to the range of its concerns as are city planning, cyberculture, astrophysics, nature, journalism, the art of living, psychology, eroticism, sociology, the art and science of taste and foods, or lifestyle issues. For every issue, Lettre recruits a single artist to design the title page and up to ten pages of the middle section. Artists are also invited to contribute to special issues and projects. Eighty-seven international artists contributed original works to Lettre 81, a double issue published on the occasion of Lettre’s 20th anniversary. Photo reports and conceptual or essayistic photography provide a multi-faceted view of events and the beauties of planet earth. Every issue presents a freestanding photo portfolio covering six to eight full-size pages. Lettre creates space for new, exciting pictures. Lettre is available by subscription (ca. 45% of all buyers), at newsstands (40%), in bookstores (10%), and directly from the publisher (5%). The German edition is for sale in Germany, Austria and Switzerland. In Paris, Amsterdam, Lisbon, Madrid, Stockholm, Copenhagen, Brussels and Luxemburg, Lettre is sold at select newsstands and in bookstores. Available four times a year, Lettre is a magazine in tabloid format, roughly 10.6 inches wide by 14.6 inches tall. A striking format capable of subsuming the contents of about three paperbacks in 136 pages. Every issue features 30 to 40 texts with a total text volume of about one million characters, as well as numerous pictures. The three-column fixed-width layout is composed of Garamond and Syntax fonts. Inside pages are printed on LWC satin paper using Heatset processes; cover pages are made using sheet-fed printing technology. All of this allows for a generous visual design, a richly nuanced, vibrant print layout and a detailed and thoughtful textual culture. The original French Lettre internationale was born in Paris in 1984. Its stated goal was to contribute to a frank, intense exchange of ideas beyond language barriers, especially across the political-military divisions of the “Iron Curtain” then dominant in Europe, by providing an intellectual publication of international scope, which later appeared in several European languages. The magazine understood itself as professing an international perspective (that is, it sought to translate and make accessible texts authored in other languages), as fostering the critique of ideology and not ideology itself, and as refraining from involvement in its home country’s national politics. The Italian edition, Lettera Internazionale, was launched in Rome as early as 1984; and in 1986, the Spanish edition, Letra Internacional, followed suit in Madrid. On May 26, 1988, the magazine’s German edition, Lettre International, first appeared in Berlin. Shortly after the upheavals of 1989, intellectuals in Central and Eastern Europe seized the opportunity to publish Lettre in their various languages. For a few years in the early 1990s, editions were also published in Czechoslovakia, Russia, Bulgaria, Poland, Hungary, Rumania, Croatia, Serbia and Macedonia. Some of these editions had to cease publication after a while due to financial constraints. For the first few years, Lettre International, Berlin, was published in cooperation with a Berlin daily, the Tageszeitung. In the mid-1990s, Lettre International, Berlin, became the property of the independent Lettre International publishing company. Today, editors in Berlin, Rome, Madrid, Budapest, Bucharest, Copenhagen and Paris closely collaborate with one another on the basis of a shared concept, all the while preserving their autonomy in editorial and publishing matters. Lettre appears in German, Italian, Spanish, Hungarian, Rumanian and – occasionally, depending on sufficient financing – in Danish language editions.